Selecting a wedding venue is one of the most important decisions you’ll ever make. You need to find someplace that’s as beautiful as your relationship, a spot that lives up to your love and will stand the test of time. Below, you’ll find 10 such places in Idaho that will help make your big day unforgettable. The Linen Building is a special space. Two years ago, the Idaho Coalition Against Sexual and Domestic Violence began the process of transforming the building “with a history of harmful, toxic working conditions for girls and women to a space that stands for what is possible when everyone is valued.” To these ends, the building has become a local HQ for activism and social engagement, in addition to an event space. If you or your future spouse believes in the causes championed by the Idaho Coalition Against Sexual and Domestic Violence, the Linen Building may be the perfect marriage spot for you. If you’re in the market for a more traditional wedding location, the Still Water Hollow is a lovely choice. Originally built in 1899, the Little White Chapel at Still Water Hollow is the perfect, traditional, picturesque setting to start a life together. The chapel can seat 150-160 guests in its air-conditioned building. Book now—it’s quite the popular spot. Alpine Ponds Event Center prides itself on creating a stress-free environment for its clients. You can choose every detail, from the kind of chairs you use to the type of linen, but when it comes time to actually set it up, the Alpine Ponds staff takes care of it. Contact them to take advantage of their flexible pricing models. The Rosewood Reception Center and Gathering Place in Pocatello, Idaho was “designed for weddings and receptions with elegant, yet functional Bride and Groom dressing rooms.” They were the recipients of the Golden Arrow Award from 2009-2013 for their gorgeous landscaping—a must for any wedding pictures. Call ahead to book an appointment and ask for Chris. Sandstone Vineyards in Kuna, Idaho is one of the Boise area’s “premier outdoor vineyard wedding venue located in picturesque Treasure Valley offering a romantic setting for one of the most special days of your life.” The vineyard is located on five acres, with “lush manicured groups, flowers, pools, Koi ponds, fountains, and walking garden paths.” In other words, it is a rustic wedding planner’s dream. When you pull up to Moose Creek Ranch, you’re greeted by a grand lodge. Beyond its doors lay horseback riding, the “western slope of the breathtaking Teton Mountain Range,” and, for a select few, the wedding spot of their dreams. Moose Creek Ranch is happy to offer marriages in all seasons. Contact them directly for more information. The Roosevelt Inn in Coeur d’Alene was once a schoolhouse, established all the way back in 1905. The staff invites you to “now experience historic elegance at The Roosevelt Inn, a romantic and relaxing bed and breakfast located in the heart of beautiful downtown Coeur d’Alene.” They have several basic wedding packages to choose from, along with various enhancements to make your day even more special. The Loft Reception Center is a quaint log cabin in Rigby, Idaho that’s just waiting to make your wedding special. They can do indoor or outdoor events and offer several pricing packages, in addition to add-ons. Check their website for an updated list of coupons. Since 1975, Ste. Chapelle has “brought new luster to Idaho winemaking,” and has become Idaho’s largest winery. In addition to creating award-winning wines, the space doubles as an event center, with regularly scheduled concerts and performances. 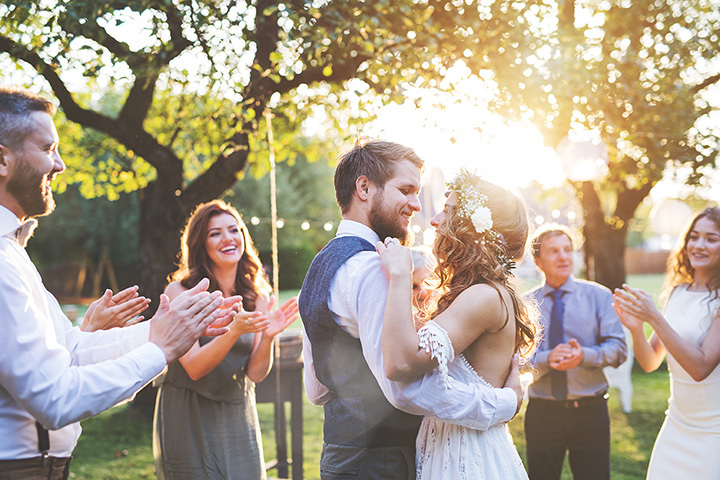 Chapelle invites soon-to-be-brides-and-grooms to consider spending their “celebration in our beautifully landscaped park that includes a lighted gazebo, bridal suite and panoramic views of the sunset.” What more could you ask for?